1 Combine bread crumbs, parsley, sage, thyme, salt and pepper in large shallow dish; set aside. 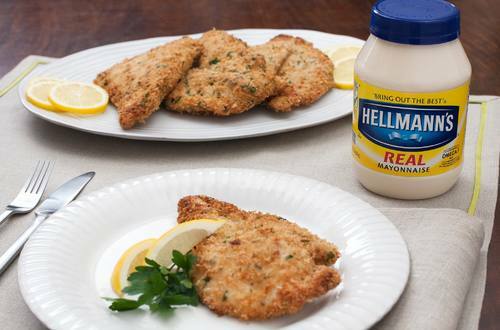 2 Combine 1/4 cup Hellmann's® or Best Foods® Real Mayonnaise with mustard in small bowl. 3 Brush 1 side of each chicken cutlet with mayonnaise mixture, then coat in bread crumbs. 4 Heat remaining 1/4 cup Hellmann's® or Best Foods® Real Mayonnaise in 12-inch nonstick skillet over medium-high heat and cook chicken, bread-side-down, 3 minutes or until golden brown and crust has formed. Turn and cook an additional 2 minutes or until chicken is thoroughly cooked.